The EPA and Heat Islands | Idaho Airships, Inc. The Fourth National Climate Assessment (NCA4, 2018) is more generally focused but certainly does encompass the Heat Island philosophy. There is no escaping that NCA4 is intended to influence statutory, common, and administrative law as well as academic and sociopolitical underpinnings. As the macro Climate Change philosophy continues its adoptive trajectory the micro aspects will gain traction. In fact, it is the micrometeorologic and microclimatologic assays that will be most potent in the types of diagnostic programs EPA is fostering, particularly in enforcement initiatives. 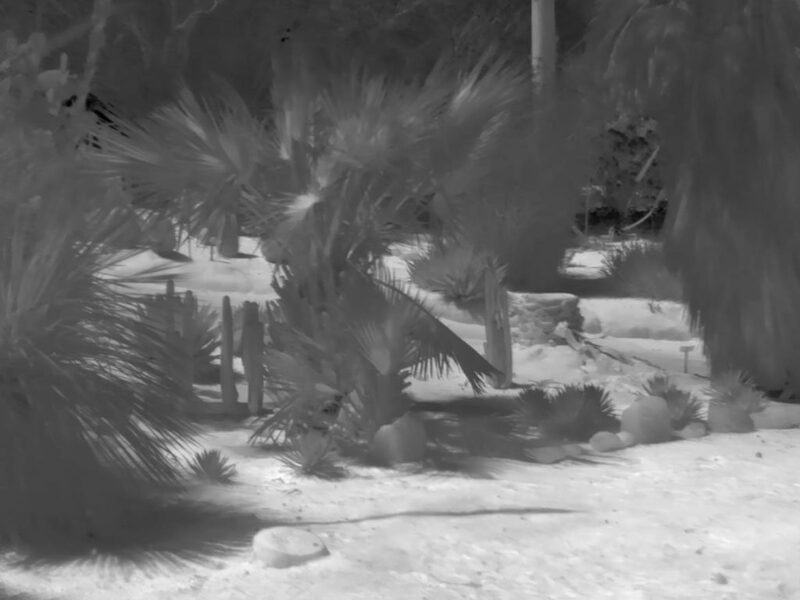 Thermogram of a Botanic Garden on an Approximately 115°F Day in July, 2018. 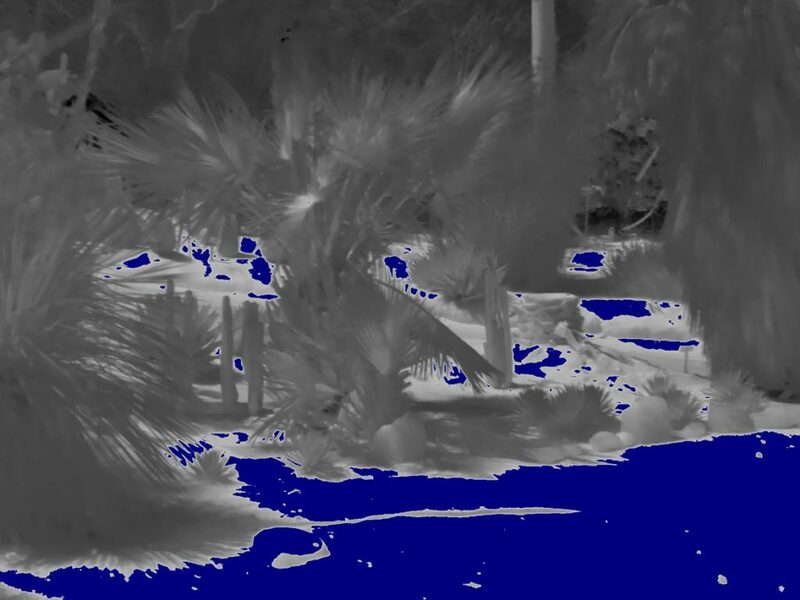 The Same Thermogram with False Color (Dark Blue) Indicating Features with Apparent Temperatures of 160°F or Higher. 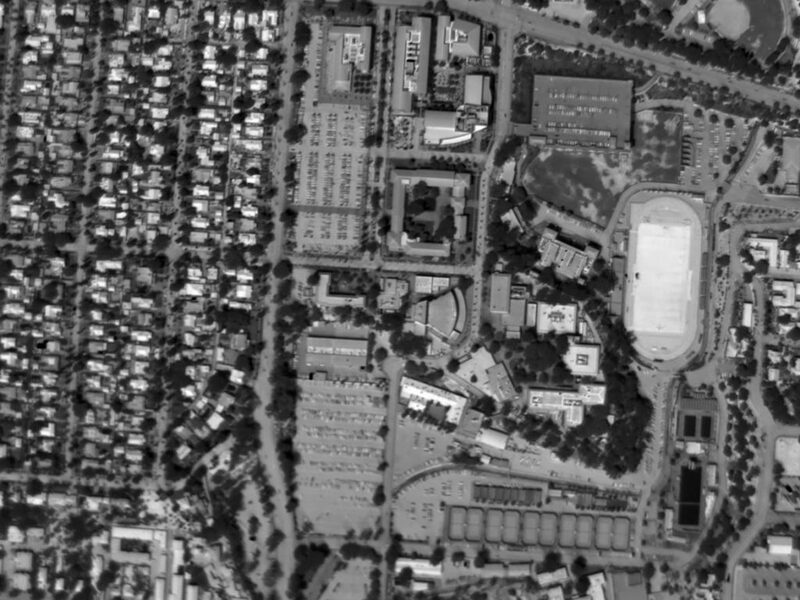 Daytime Aerial Thermogram of a College Campus with Synthetic Turf at an Apparent Temperature Exceeding 170°F. Ground Ambient Temperature Approximated 105°F. 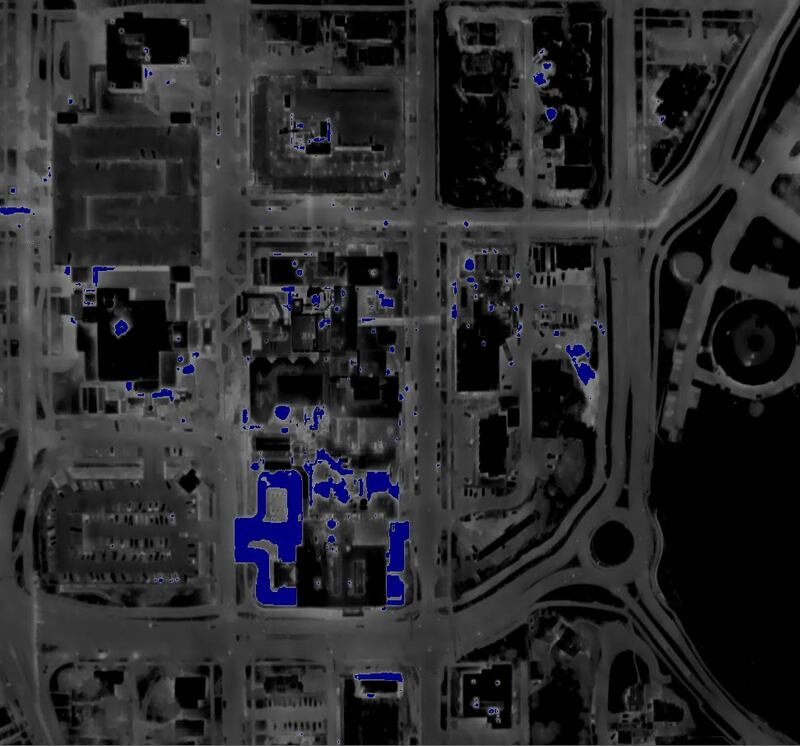 Night Aerial Thermogram of a Hospital Complex with False Color (Dark Blue) Indicating an Apparent Temperature Exceeding the Approximate Ambient Temperature (20°F). The preceding examples are agonizingly elementary and do not necessarily indicate thermal pathologies.1 They do illustrate latent thermal features in micro contexts and rudimentary practices to visualize them. 6-12″ Ground Sample Distances (GSD’s) have been empirically proven sufficient for common urban structural thermal analysis, though tighter samples are more defensible in some quantitative exercises and with respect to Nyquist and IMFOV. Oblique data sets-and areas of substantial axial displacements in orthographs-suffer profoundly variable emissivity and reflectivity (ε and ρ) and can be tedious and knotty to analyze. This tends to compel high altitude (e.g. 2,000AGL), “long lens” (e.g. 28HFOV) collections that are not possible with common sUAS (“drones”). Superfluous spatial data can be logistically and tactically hostile; it is crucial that ambient conditions (temperature, convective events, insolation, etc.) are as static as possible during discretely timed collections, and sometimes as close as is possible to a comparative assay. Applying thermographic data to LiDAR is expected to be a dominant practice in critical assays; the advantages of thermal patterning-including temporal thermal patterning-in three dimensions can be very descriptive of interests relating to current interpretations of EPA’s narrative. 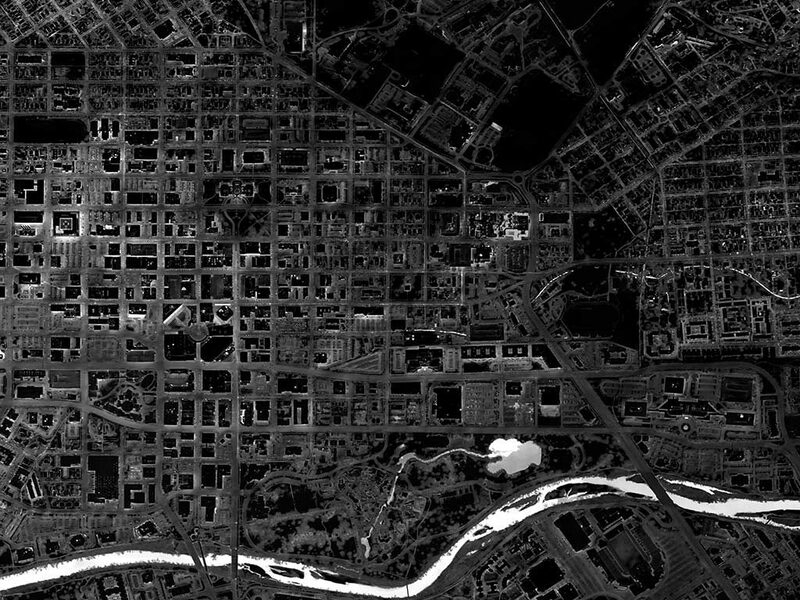 Small Section of Urban and Suburban Thermal Map of Boise, Idaho, 12/18. Thermal Contributions to Context Are Obvious in the Urban Core.